Wow! It’s been awhile since I posted a full week of bentos, but my Christmas bento box game has been strong this week and I’ve somehow managed to make one every single day for six school days in a row. An event like this calls for a celebratory blog post! Woo hoo! I kicked off the Christmas lunches a week ago today when I decided to get my holiday bento gear out of storage on the spur of the moment. Augie and I were talking about his lunch as I was making it and we decided his sandwich needed to be way more fun, so I dug my stuff out of the cupboard over the fridge and pulled a couple things out to decorate his already completed lunch. He had candy-striped apples, rice crackers with an elf ring and a sunflower butter and jelly sandwich with a Santa ring tucked between the two halves. This was packed in an EasyLunchboxes bento box . 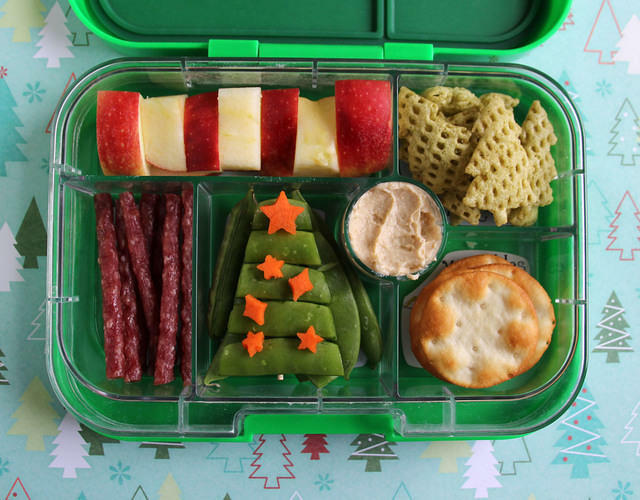 The next day I had a little more time to think about what I wanted to put in Augie’s lunch and this is what I came up with: candy-striped apple, Tannenbaum chips (from Trader Joe’s), mini salami sticks, a sugar snap pea Christmas tree with carrot ornaments, hummus and some crackers. This was packed in a green Yumbox original (Ooh! Festive!). Normally I wouldn’t put in both crackers and chips but I ran out of time while I was making this and suddenly had one minute to finish it so I panicked and filled the last compartment with the first thing I could find — the crackers. Thank goodness for crackers! They’ve saved a lunch more times than I can count. I was part-way through this lunch when Augie announced that he wanted it to be a Pokemon Christmas lunch. 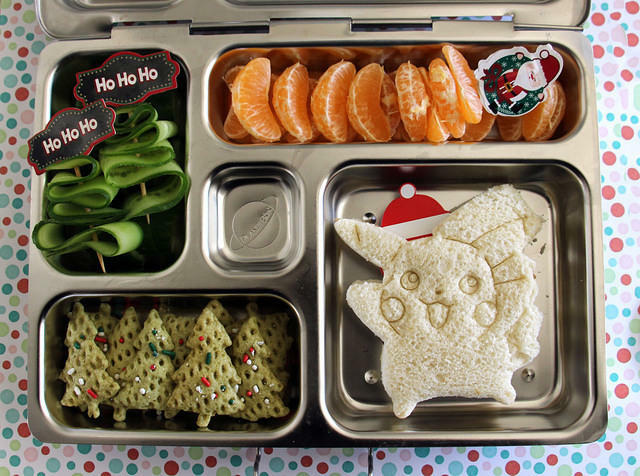 I hadn’t made his sandwich yet, so I grabbed our Pikachu cutter and used that. We both agreed that Pikachu needed a Santa hat, but I didn’t have a Santa hat pick so I had to improvise. I ended up using a Santa pick and sliding his face under the bread so all you could see was the hat. I think that worked out pretty well. (The pick I used was made entirely of paper so I told Augie to be careful to get it all out before he ate his sandwich. Nothing ruins a sandwich like a big wad of paper in it.) 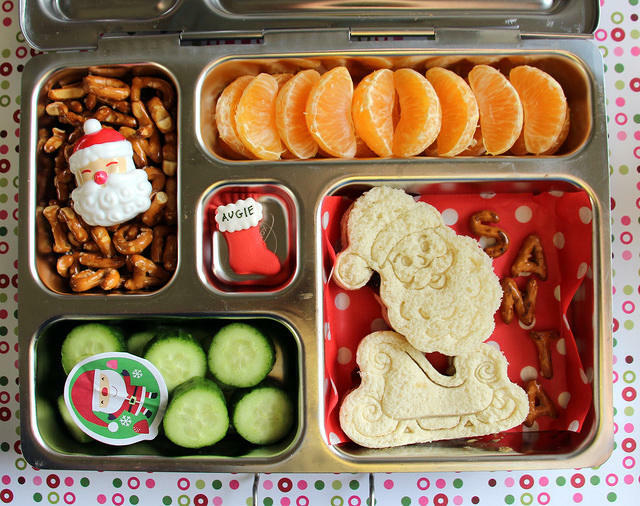 The rest of the lunch (packed in a PlanetBox Rover) was: cucumber ribbon trees, Mandarin oranges with a Santa pick and Christmas tree chips with a few sprinkles. 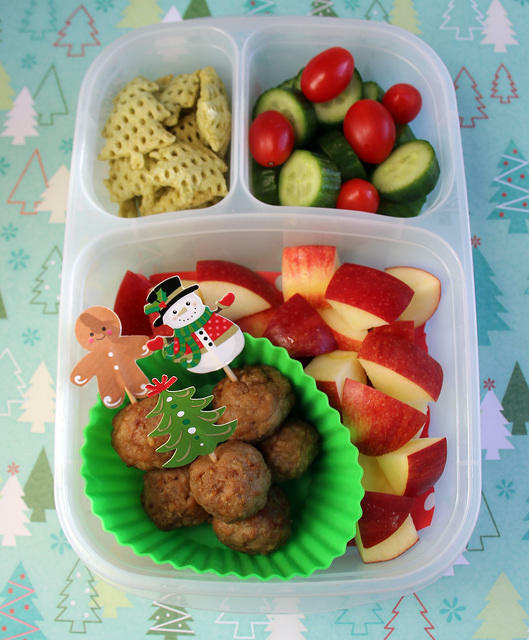 Friday morning I was in a rush again, so I toned things down a bit: Christmas tree chips, red and green veggies (cukes and tomatoes), apple chunks and some meatballs from the freezer that I warmed up and threaded onto cute Christmas cupcake picks. This was packed in an EasyLunchboxes bento box . And finally, let’s keep things real. 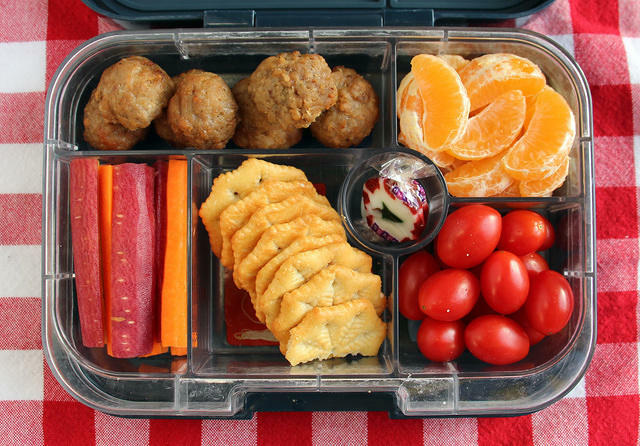 I was fresh out of inspiration this morning and this lunch was as much as I could come up with: meatballs, oranges, rainbow carrots, holiday Ritz crackers, tomatoes and a peppermint candy. Is it as decorative as the other lunches I posted? No, it is not. Was Augie as excited about this lunch as the others? Yes he was. Never underestimate how powerful adding a single piece of candy to a lunch box can be!